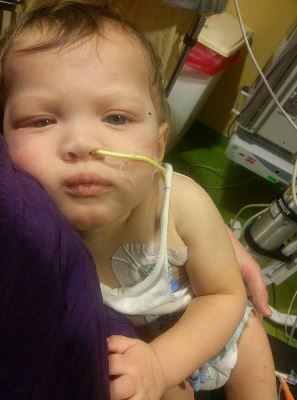 Lil Ray Needs a Transplant and His Family Needs Your Help! My grandson, Ray Glass III was born in March, 2014. Almost immediately the doctors noticed a problem. Ray has had multiple surgeries, procedures, tests and has been in the hospital for months on end. Ray had one kidney fail and has lost his other kidney to kidney disease. He will be placed on the transplant list as soon as he has gained the weight he needs to be eligible, which the doctors believe will be in six months. In the meantime, dialysis will keep him alive until he can get a transplant. The amazing thing about this little fighter is that he continues to smile through his fight. Katie Fox, Ray’s mom works 60 hours a week, coaches her daughters baseball team, takes her older son to his practices and games while running to the hospital and keeping up with Ray’s medical needs. Needless to say she is run ragged with all of this; yet she keeps a smile on her face and a kind word for everyone is always heard coming from her lips. Ray Glass 2nd works full time on the road building silos. When he is able to be home, he is splitting his time with the two children at home, the hospital, and trying to give Katie a minute to herself. The children miss their brother so much when he is away at the hospital they cry for him to come home. Transplants are life saving but financially draining. Even with insurance, there are many expenses not covered such as co-pays, caregivers, travel for pre and post-transplant medical visits and the costly anti-rejection medications that Ray will have to take for the rest of his life. To help with the financial burden of Ray’s uninsured expenses, a fundraising campaign in his honor has been established with HelpHOPELive, a trusted nonprofit organization that has been providing community-based fundraising guidance to patients and their families for more than 30 years. All donations are tax-deductible, are held by HelpHOPELive in the Great Lakes Kidney Transplant Fund, and are administered by HelpHOPELive for transplant-related expenses only. Please consider making a contribution to support Ray’s fight. Please repost this appeal and visit Ray’s HelpHOPELive webpage for updates and information on fundraising activities. Thank you for your prayers, support and generosity thus far. Please know that your contribution counts. On behalf of Lil Ray and his family, we thank you in advance for your kind consideration. Lil ray is now scheduled to come home tuesday. Bc he will have clinic visits every tues and fri they didnt want to send him home just to turn around and come back tues.
To be honest I am nervous for him to come home. There is so much to do for him. Meds, shots, blood pressure checks, gtube feeding and keeping him out of mischief. Its just been so long since he has been home. We are getting our room together bc he will be with us bc his feedings overnight will cause his machine to alarm overnight. And its not fair for the other kids to wake them up. I know this will get easier, its just scarier bc there is not a nurse outside the door. And all that he has been through this past year. Ray is doing well with his dialysis. He is trying to regain ground with learning to walk talk and tryin relearn how to eat. All. The skills he lost since he was down so long and being tube feed. Ray will receive his mother’s kidney on September 29th if all goes as planned. Katie Ray’s mom thanks everyone for the and prayers. They have now decided that we are ready to proceed with the transplant procedure. They are contacting my living donor coordinator with the orders to go ahead with all of my testing, they said he will be on his antibiotics for about three to four more weeks to clear out any of the infections that are in there from the peritonitis infection. Ray is resting comfortably. They removed the catheter just fine they were able to drain the extra fluids that were causing the issues. His heart rate has come down his blood pressure is stable. The peritoneal dialysis catheter is still not working. They attempted the first round of peritoneal dialysis yesterday with a failed attempt, the dialysis catheter had a hole in it so they cut it down put the titanium piece back on and attempted to do it today again it failed. It will allow the fill and dwell cycle but will not drain. It has also tested positive for staph infection they will try again after the antibiotics have taken effect. He is very tired today. They are running out of good veins to use and also have to be careful not to use certain ones in case we need it for another dialysis. Another set back frown emoticon. Today Ray ray’s blood pressure is awesome! And the doctor said it’s becoming a regular occurrence!!! Small steps, big blessings! Today lil Ray was supposed to have his follow up ENT scope done. But like everything else it didn’t go as planned. His PD catheter isn’t flushing. It will allow fluid in but not out. So they fear it could mean 2 things. The scar tissue is making the catheter not work or the catheter is wrapped around the fatty layer behind his skin. Xray showed no bowel blockage. Surgeon is going to place a scope in and see what is wrong. So from the looks of it we are looking at another surgery to remove and put another PD catheter in. His poor belly has been cut up so much. I am seriously praying my son can honestly have something go right for once in his life. On a positive note I did pass the first stage of being his donor. Next step is blood work. Ray is doing well after the surgery that took his 2nd kidney he is now in a regular room. he will spend at least another month in the hospital before he can come home on Dialysis which he will have to be on every night for 12 to 13 hours. He will have to be seen many time during his waiting period by the doctors and have many test to make sure things are going well. Thanks you for you support. Love you guys Katie and we pray for all of you daily!! Your family as a unit is incredibly strong! Give it to God.